Patios are a very practical way to expand your living space and have a place to entertain or just hang out and enjoy the nice weather. 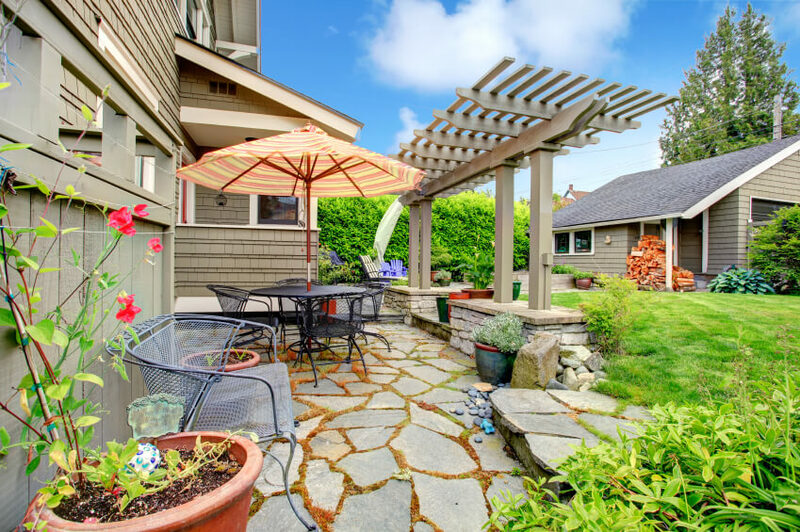 If you have been planning to add a patio to your backyard, take a look at how you can do this with confidence. Check the area where you plan to put your patio. Create a plan for your patio. Lay your stones on the sand. The site of your patio will determine the amount of use you get from it. Choose a place that you and your family will want to spend lots of time in. Make sure it has a slope no more than 1/4 to 1/5 of an inch per foot so that you have good drainage but won’t need to put up retaining walls to provide support for your patio. While making your survey, find out what type of soil the area has. Soggy soil means you will need more gravel. Make a draft sketch of your patio and, with this in mind, measure the projected area. Once you have the measurements, transfer your sketch to graphing paper, allowing each square to represent a square foot. This will make it easier for you to estimate the materials you need. When you know the dimensions of the patio you are planning to build, you will know what materials to order. 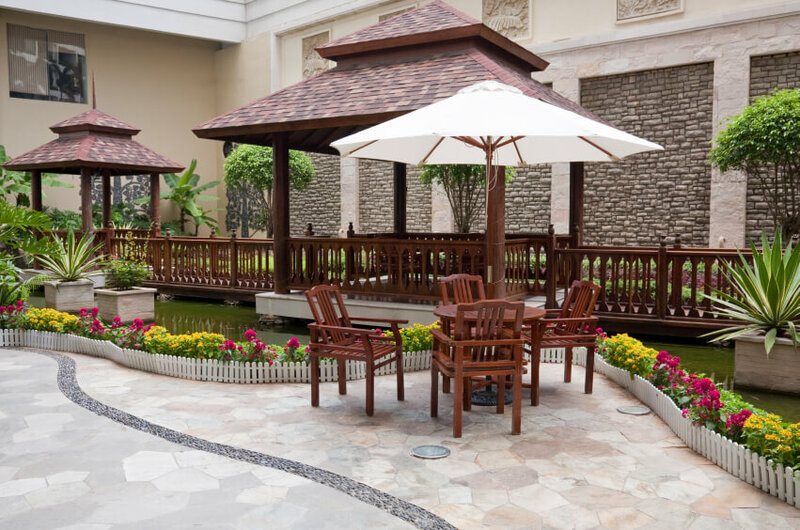 If you visit a reputable company selling landscaping and construction supplies, you will get good advice on how much material to order after you have chosen the kind of stone tiles or pavers you want for the floor of your patio. Apart from the tiles for your flooring, you will also need quite a lot of other things to build a durable, well-finished patio. Landscape fabric. Usually made from polypropylene or some similar material, landscape fabric will act as a base for the layer of gravel underneath. This separates the gravel from the soil. Granular fill. You can use gravel, fine angular limestone, or recycled concrete mixed with asphalt for the bottom of your patio foundation. This layer makes sure you have a base that is firm and yet allows water to drain. Depending on the kind of soil you have, you will need to put in four to ten inches of this material. Sand. You will need about an inch of coarse, washed sand to spread over the gravel. The stone paving of your patio will sit on this layer of sand. You will also need some of this material to fill up the spaces between your stone tiles. Begin preparing the site of your patio by marking the outline of your desired patio with limestone or a garden hose. Then, put up a line running down the center of the proposed patio and adjust this line so that you have a gentle slope towards the direction where you want water to drain off your patio. Following the outline you made, dig out about ten inches of soil from the patio area. The depth of your excavation will be based on the gravel you need at the bottom of your foundation, the inch or so of sand, and the height of the stone you will use. As you dig, pay attention to the line that will guide the slope of your patio. You can use the soil you excavate to make raised beds, or you can rent a Dumpster to dispose of it. Once you have excavated the soil from your patio site and the landscape fabric is in, you can begin to put your foundation materials in. Just make sure your landscape fabric is spread out flat against the base of your excavation with six to eight inches of the fabric extending over the patio. Pour in two to three inches of gravel and tamp this down. After you have done this, spread another two to three inches of gravel and tamp this down again. If your soil is soggy and needs more than four inches of gravel, add what you need and tamp down to meet gravel requirements. Keep checking the slope of your foundation, making sure you do not exceed the 1/4 inch slope limit per inch of your patio’s length. Spread an inch or more of sand over the gravel and tamp this down. To make sure everything you’ve laid out is compact, hose down the surface and tamp this down some more once the water has drained. Before laying out the stones, set up strings parallel around the patio as your reference point for your flooring. You can now begin to lay the stones on your sand layer. Lay your stone pieces so that they are about half an inch apart. This will be like putting together a large (and heavy) jigsaw puzzle. Carefully tamp down the stone pieces, making sure your flooring comes out even on top. Make the necessary adjustments by either adding or removing a bit more sand under the stone. Fill up the spaces between the stone pieces with sand or some decomposed granite. And now you get to kick back and relax on your brand-new patio. Don’t miss our outdoor living ideas to make sure you’re getting most out of your new space.